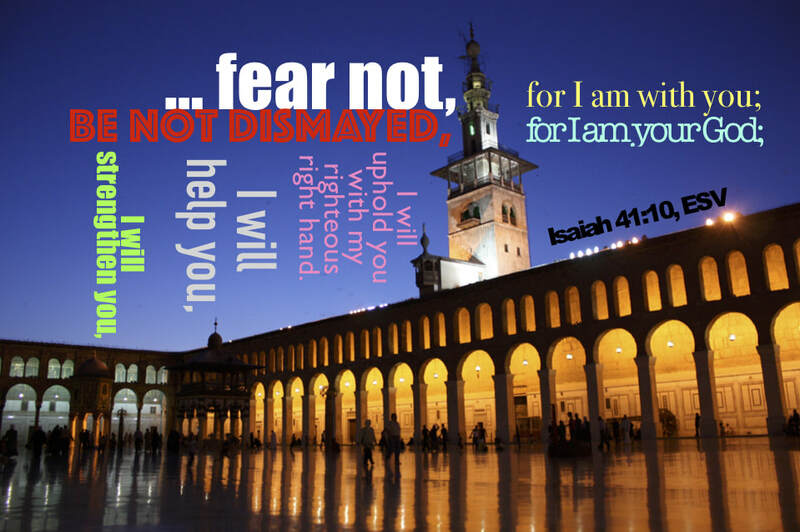 Isaiah 41:10 is one of my all-time favorite verses. I memorized it years ago along with a host of other Scripture passages as a new young believer being discipled through The Navigators’ ministry while serving in the Marine Corps. The year was 1978, and I was about to get throttled from the Philippine Islands when my squadron stood ready to confront global Islamic realities during the Iranian hostage crisis. We stood down that April 1980 with the failure of Operation Eagle Claw, but that experience marked the beginning of a life-long quest to understand Islam and subsequently become part of God’s purposeful move to engage Muslim peoples worldwide with the Gospel of Jesus Christ, if even through back-door strategies as I’ve since come to embrace (write me if your interest is piqued). I have however, seen over the years that when it comes to engaging Muslims the continued posture of the Church has seemed to be one of “fear,” if even in not knowing 'how', 'when' or 'where' to engage them. There is a place for wanting to get things right when it come to engaging and loving Muslim peoples, but these are all so often excuses for not wanting to confront inner fears. Now let’s be clear here… the Bible declares in no uncertain terms the person of faith will be a person who will “fear not” in the face of formidable life obstacles. This phrase, or some variation thereof (eg. “be not afraid”) may be the most oft repeated idea found in the Bible, with God Himself and/or His angelic host repeating the idea over 80 times throughout. And make no mistake, many of these statements are commands just like we find here in Isaiah 41:10. For more of the skinny on our future click here.